It’s that time of the year when the sun abates making way for the cool monsoons, so is your home ready for the change? Monsoon heralds not just a change in season but a contrast from the bright summer days to gloomy and dark days. 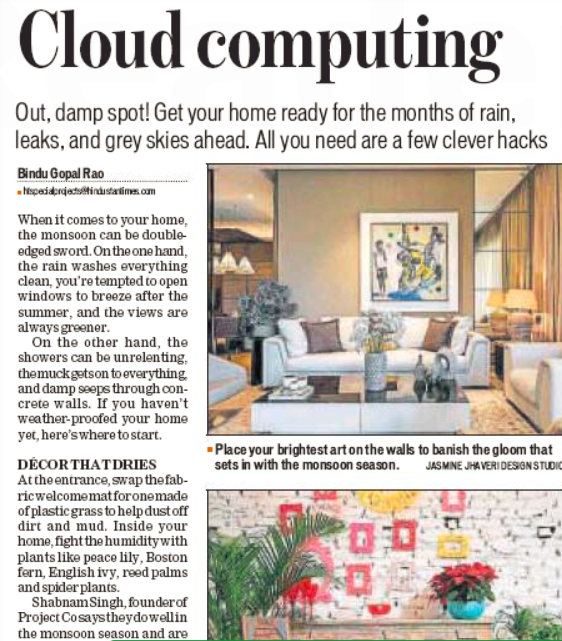 However, your home can beat the blues by being monsoon ready and we tell you just how you can brighten up your home before the monsoons arrive. The first thing to do is to ensure you have enough light but make sure that you do not overdo it. Instead of your strong overhead lights, opt for accent lights such as a floor lamp or an up lifter within your plants. Place them in different corners of the room. Pair these with delicate cove lights to create a warm, inviting space. Anupama Bihani, founder & Interior Designer, Mirabel Interiors, Delhi says, “brighten up the home with floor lamps and let the dusky sky make home look romantic and bright. Use yellows and orange if going for a white wash and polyester and nylon furnishings is an excellent way out to save your sofas and curtains which are close to the window.” Remember to replace your fabric mat with a plastic grass mat so that it absorbs both dirt and mud. Again, to control the moisture level adding plants like Peace Lily, Boston Fern, English Ivy, Reed Palm and Spider Plant help. Shabnam Singh, Founder, Project Co. “bring green plants into homes as they do well in the monsoon season and are low on maintenance and easy to look after. They add a fresh spark to the place, keep it fresh and also absorb excess moisture and mildew that may be in the air.” Growing vertical gardens at home is another way to get your green thumbs into action. “The vertical gardens transform the most unutilized wall spaces into striking aesthetics and assist in reducing stress and could stimulate relaxation. Most importantly monsoon is the best time to grow plants as the mortality ratio is comparatively low and plants get easily adapted to the climate,” says Sujit Jain, Founder, Griin. An easy way to achieve a bright look would be to have bright linen mixing print with solids. 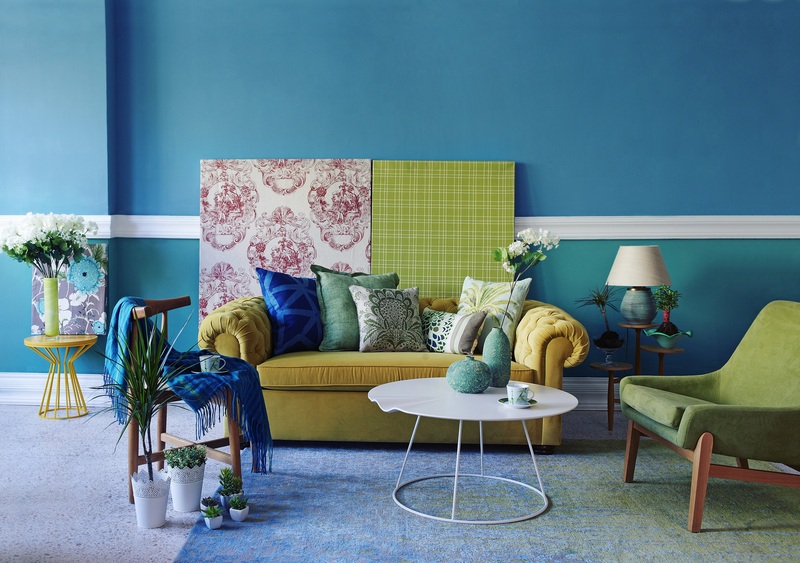 Another great option is to go for vivid art in bright hues. Look at mixing and matching ethereal watercolors with statement oil paintings. “This would create a textural space that resonates with a personality. Build it up with 3D pieces such as sculpture or candles to add flair. If maximal style is not your aesthetic, opt for a pristine white gallery wall. Highlight it with mixed art framed in silver and gold for a classy touch,” says Interior Stylist Jasmine Jhaveri. Sanjay Agarwal-Promoter and MD, Sirca Paints avers, “simple yet graceful variations in the decor can make your home monsoon ready. Brighten your room with vibrant shades like corals and yellows, red, greens are perfect for the low feeling.” Monsoons also call for light fabrics and therefore fabrics with synthetic blends work. Chitra Das, Founder, Champs Fleur explains. “bring in flowers especially in bright colours and set them on your study table, personal workspace, and dining table. Add cushions with bright shades of tangerine, citrus, turquoise and pinks. These can match your flowers and will surely add the much needed colour to your house.” A signature monsoon accessory is a hanging chair or a swing placed in the living room or the balcony area where one can enjoy the rain with a hot beverage. “Sweet scented candles especially lavender, lemongrass or vanilla fragrances placed on center accents or in the living area give the room a comfortable and romantic feel,” says Arshi Mukri, Interior Design Expert, Pepperfry. While getting your home monsoon ready the key is to remember that decor is an art and you should never overdo a space. “Going over board by incorporating too bright elements would definitely be a turn off or even too much cluttering for that matter. A delicate balance between aesthetics and design is the key to a perfect décor,” says Tarun Yadav, Ansav. Go the traditional way and be monsoon ready Ishan Thacker, Associate Director, Vector Projects (I) Pvt. Ltd. avers, “place a few naphthalene or camphor balls, neem leaves or cloves in your wardrobe and drawers. These absorb moisture and are an effective solution against silver fish, a common problem during rainy season.” For the walls in the bedroom, use a palette of white and near white tones that form a blank canvas to your artistic room. It is believed that your mood reflects in the food you make, so it is necessary to quirk up the kitchen interiors. 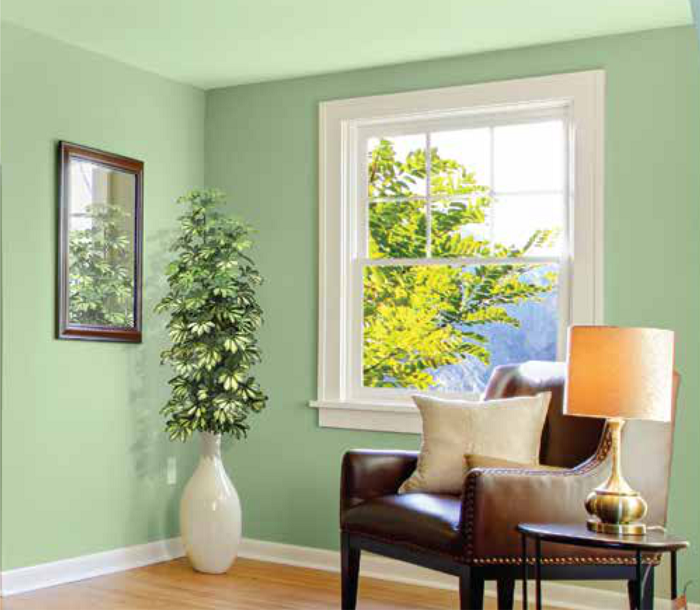 “The colour green is a colour that is well associated with nature, allowing a room to feel relaxing to the eyes and refreshing for your mind. When paired with whites, this palette can turn a bland room into a welcoming paradise,” says Peeyush Bachlaus, GM Marketing, Kansai Nerolac Paints Ltd. So is your home ready for a monsoon makeover? Keep a decorative bucket close to entrance door for holding the wet umbrellas. 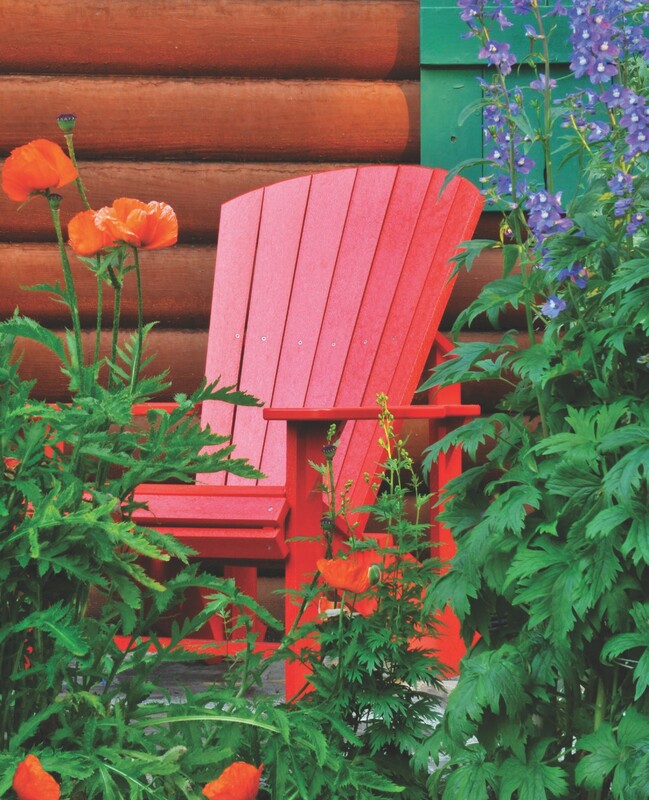 Brighten up your space with cheery plants and flowers and take it a notch higher with stylized coffee-table books. Add a splash of colour with a mix of ceramic and stone vases. Jazz your space up with textural cushions. Invest in sheer fabrics that will allow sunlight to stream in. Pre-check the electrical setups, pipes and other plumbing, as well as leakages. Wax and oil your furniture, also maintain them instead of purchasing new ones.